It's the day the clocks go forward. It's the last Sunday in March, so this is normal. What's not normal is that the clocks may only go forward two more times. In all the Brexit turmoil last week one bit of European news got somewhat drowned out, which is that the EU intends to cancel Summer Time. For almost 100 years the UK has put its clocks forward an hour in spring and back an hour in autumn to maximise the use of available daylight. There are lots of plusses to an extra hour of daylight in the evening for seven months a year, including less need for indoor lighting and increased recreational opportunity. But there are also minuses, chief amongst these being a behavioural disconnect twice a year, shortening or extending time available for sleep and upsetting circadian rhythms. The EU has mulled over the issues, reviewing scientific research and consulting millions of citizens. "Numerous studies looked into the link between the switch to summer time and the risk of heart attacks, disrupted body rhythm, sleep deprivation, lack of concentration and attention, increased risk of accidents, lower life satisfaction and even suicide rates. However, longer daylight, outdoor activities after work or school and exposure to sunlight clearly have some positive long-term effects on general well-being." And their collective opinion is that the benefits of summer time are minor when compared to the downsides, so summer time is being scrapped. Initially their plan was that the final change would be in 2019, but it was pointed out that IT systems, timetables and the like need time for preparation and so 2021 has been picked instead. In March 2020 and March 2021 time will advance as normal. In autumn 2021 clocks may go back an hour, if that's what countries want. But after 2021 clocks will never change again. This leaves one key decision to be made by each individual member state - when the music stops, which time zone do they want to end up in? For example, Germany currently spends 5 months a year in GMT+1, which is its base state, and seven months a year in GMT+2. They could decide to stick with GMT+2 (permanent summer time), in which case the clocks would go forward in March 2021 and never change again. Or they could decide to stick with GMT+1 (permanent winter time), in which case the clocks would go forward in March 2021, back in October 2021 and never change again. It's quite the choice. You'd expect most mainland European countries to stick together and pick the same zone, to avoid awkward clock changes every time someone crosses a border. That's pretty much what happens now, with GMT+1 the default from Spain across to Poland. But every country gets to make its own separate decision, and has to submit it to the EU by this time next year, so anything could happen. For example, Spain lies within 7½° of the Greenwich Meridian so should by rights be using GMT/GMT+1 like the UK and Portugal, but instead uses GMT+1/GMT+2 like France and Germany. Which way will they jump? Might Portugal follow? But for us in Britain, Brexit makes the decision doubly intriguing. In normal circumstances we'd be about to be forced to pick either permanent winter time (GMT) or permanent summer time (GMT+1) and stick to it. But these are not normal times, and if we leave the EU we get to ignore the directive and go our own way. 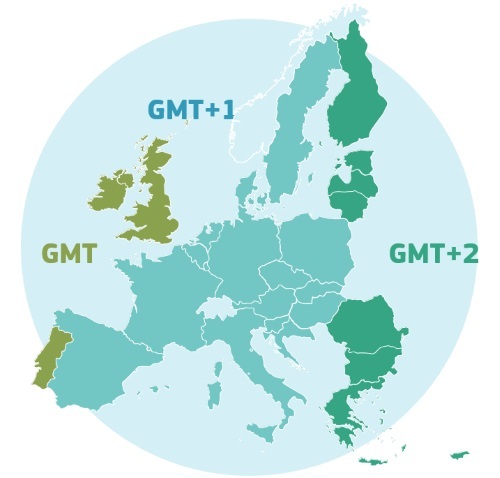 If we leave the EU this year, we can carry on switching between GMT and BST forever. I can imagine a populist Prime Minister being extremely keen to maintain the tradition of British Summer Time, a quick and simple means of differentiating ourselves from Europe and 'taking back control'. Business might not like the lack of harmonisation, but for most day-to-day purposes an independent Britain could choose to do whatever the hell it liked. Alternatively if a long Brexit delay kicks in and we're still in the EU in 2021, summer time will no longer be an option. We'll be forced to pick either GMT or GMT+1 and stick to it, and will only be able to reverse that decision if withdrawal ever takes place. I can hear MPs arguing even now, "pass Meaningful Vote 31 and get your lighter evenings back." Thanks to Brexit the abolition of summer time is not the pressing question it would otherwise have been. But which would have been the better time zone for Britain to end up in, GMT or GMT+1? Here's what GMT (permanent winter time) would look like throughout the year. Data is for Leeds, because that's roughly in the centre of the country, and times are approximate (for the middle of the month). November to March would be identical to what we have now, daylightwise, and you know what a UK winter feels like. But April to October would be one hour behind, because summer time wouldn't take place, and that bit of the table is shaded. Sunset would never again be after 9pm, indeed in the London area the latest it would ever get would be twenty past eight. That'd be an unwelcome shock, given that London currently enjoys four months with sunset after 8pm, and that'd be cut to just two. All that daylight has to go somewhere, and that somewhere is the early hours of the morning. Under permanent GMT the sun would rise well before the majority of the population woke up for most of the year - in midsummer as early as half past three. All this wasted daylight is precisely the reason summer time was introduced in the first place, and we'd be throwing all that away in favour of shorter evenings. So maybe not GMT. How about GMT+1? Here the summer is what you're used to, and the (shaded) winter months are the different bit. Evenings look good, with the earliest sunset now close to 5pm rather than the miserable 4pm we get at present. That'd likely mean fewer accidents heading home from work or school. But there has to be payback somewhere, and that payback is in the morning. In the depths of winter the sun wouldn't rise before 9am, which would mean going to work or school in the dark and probably more accidents too. In the north of Scotland the sun wouldn't rise before 10am, which is why Scotland rarely thinks the same way as London when it comes to changing the clocks, and permanent GMT+1 would only make things worse. Essentially there are good practical reasons why Britain follows GMT in the winter and GMT+1 in the summer. But the EU has judged that the negative effects around changeover outweigh the benefits in the months inbetween, and so wellbeing has trumped daylight saving. In the EU at least. An unintended consequence of this decision, post-Brexit, would be a temporal disconnect along the UK's land border. Assuming we leave before the regulations come in and choose to retain British Summer Time, the island of Ireland would find itself in two different time zones at certain times of the year. That'd be awkward. If the Republic of Ireland decides to plump for permanent winter time, i.e. GMT, then Belfast will be an hour ahead of Dublin for seven months a year (from April to October). If instead the Republic of Ireland decides to plump for permanent summer time, i.e. GMT+1, then Belfast will be an hour behind Dublin for five months a year (from November to March). It has to choose one of these options, and neither would be ideal. Mainland Britain won't care, but as is so often the case with Brexit the full impact will be felt across the Irish Sea. Cancelling summer time is the most important decision future Britain doesn't have to sign up to, shifting everything the entire population does by an hour and changing the future in as yet impenetrable ways. Just for a change, Brexit looks likely to save the UK from a choice affecting all of us forever.